Ecotourism may be the best hope for Madagascar to improve the standard of living for its people and indeed ecotourism is growing in the country: according to the Bradt guide around 50 percent of visitors to Madagascar now visit a protected area when they come to the country (up from 20 percent in 1995). Responsibly managed ecotourism can generate substantial amounts of revenue and employ large numbers of local people without causing significant environmental damage. And because ecotourists pay to see a country's natural beauty it gives local people a direct incentive to conserve the environment around them. Ecotourism can help assign value to an ecosystem, and most ecotourists are willing to pay directly for preservation in the form of park entrance fees and the hiring of local guides. 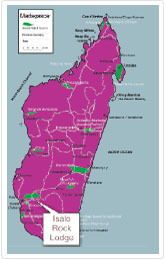 In Madagascar local communities benefit directly from ecotourism through their 50 percent share of park entrance fees (park entry fees are divided equally between ANGAP and local communities), sales of handicrafts and "tourist items," and employment as porters, wildlife guides, park rangers, and workers in the service force of hotels, restaurants, and lodges. The guide-training programs (ANGAP has a three-year program for new guides) help the local community as a whole through the education of its members. With an education and an understanding of multiple languages, children in the community will have better opportunities in the future. Malagasy tourists need to show respect for their environment as well when they travel to other parts of Madagascar. There's nothing that will rile an ecotourist faster than watching other tourists littering the ground with their trash and cigarette butts. We vstrive to keep our Keep our ecotourists happy, discourage littering and ruining the environment and culture of the country.